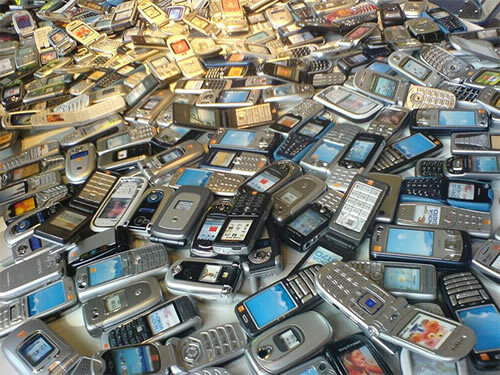 The International Sign Expo (March 22nd-24th) is a great way to see exciting new technologies in the sign industry. 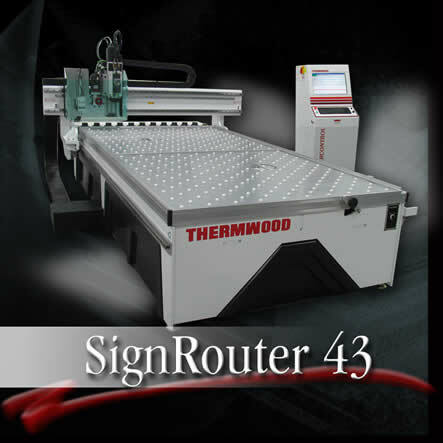 Thermwood has been in the sign industry for many years and will be showcasing our SignRouter 43 demonstrating the machine capabilities by machining aluminum, plastics and foam (Booth #1080). Thermwood is offering Free Trade Show Passes to the 2012 International Sign Expo in Orlando, FL, March 22nd - 24th. If interested, please click on the link below to regsiter for a free pass. 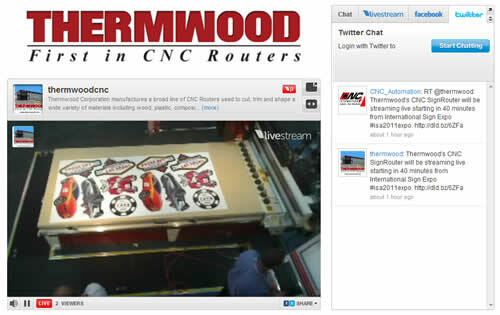 Thermwood Streaming Live at the International Sign Expo in Las Vegas! 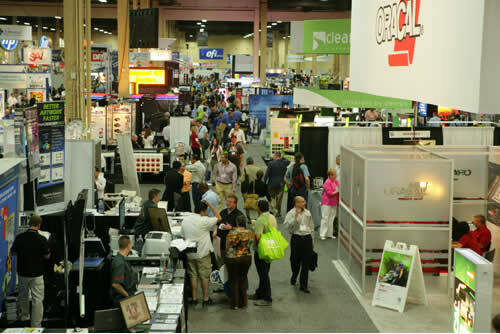 We are streaming live from the International Sign Expo in Las Vegas, starting today 4/28/11 at 11:00am CST. See our SignRouter 43 with i-cut Vision technology in action direct from our Booth #5333. It is like attending the show from the comfort of your office! You can also interact directly with our folks at the show via real-time chat. 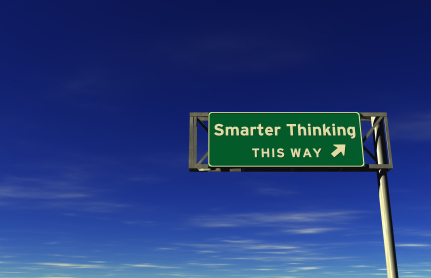 Ask questions and also see what everyone is saying on Facebook and Twitter about our exciting approach to the sign industry (all in one place). Thermwood’s SignRouter43 with “QuickCut” technology also offers a revolutionary new approach for nested based applications. 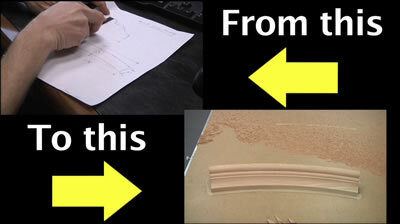 Just select and resize cabinets and closet components, then make them…right at the machine. You don’t need design software. You don’t need extensive training or a painful learning curve. Pretty much anyone in your shop can make cabinets and closets with a few minutes instruction. It’s not much more difficult than running a copy machine. The SignRouter 43 is a robust, highly flexible production system capable of operating 24 hours a day, seven days a week. Today is the first day of the International Sign Expo in Orlando, FL. The Expo runs through Saturday April 10th, and Thermwood is exhibiting our SignRouter 43 with i-cut on hand, machining sign materials ranging from acrylic to a wide variety of substrates, as well as a few surprises! Plan to stop by Booth #2680 to see us in action and pick up a souvenier for yourself. Here is a pic of the action at our booth. Please check our Twitter Account for ongoing uploads from the show. 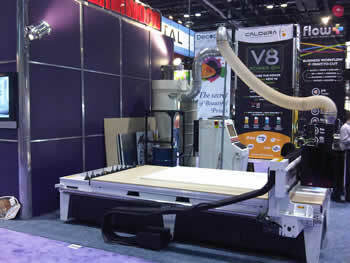 Thermwood will be exhibiting at the International Sign Expo 2010, held April 8th-10th in Orlando, Florida. We will have a SignRouter 43 with i-cut on hand, machining sign materials ranging from acrylic to a wide variety of substrates, as well as a few surprises! The SR43 is capable of machining flat and three-dimensional signs using wood, aluminum, composites, chip core, rigid foam, plastics, acrylic, non-ferrous metals and other various types of materials as well as operating as a traditional sign-making machine using optional i-cut Vision camera and software (these highly capable systems accurately trim printed signs, automatically compensating for distortion or rotation in the printed image).